With all the energy of a rock band and the synchronism of an orchestra, Sounds of China brought a magical performance to Bucknell University on Thursday, February 7th. The Sounds of China Neo-Folk Music Group was founded in 2014 by artistic director Ma Jiuyue, one of the pioneers and initiators of Chinese neo folk music. The group is made up of young instrumentalists from China’s top conservatories and state-owned performing arts companies. 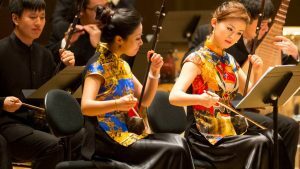 With strong roots in traditional Chinese music, Sounds of China creates a harmonious blend of Chinese instruments— including the erhu (a two-stringed spike fiddle), liuqin (a four-stringed Chinese mandolin), xun (a globular, vessel flute), pipa (a plucked four-string lute), and guhzeng (a Chinese zither)—with Western orchestral instruments and Western music styles. Their unique compositions took the audience on an auditory journey through joyful highs, charming melodies and whirlwind rhythms, culminating in a brilliant encore.